A squid had[sic] eight arms and two tentacles plus the ability to inject an inky substance to permeate the water and hide itself. Its skin changes color to suit its environment. It maintains the highest survival intelligence among invertebrates. 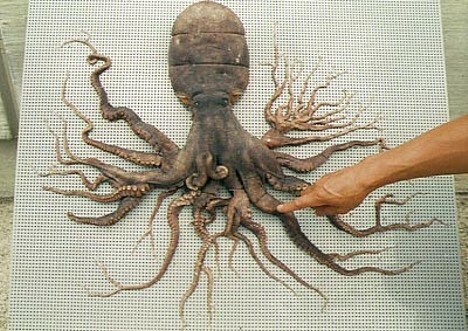 It has the biggest eyes in the animal kingdom; chop off a tentacle and it can grow a new one. Chop off its head and under special circumstances it can regenerate another. For a Midwest political commentator, that is an admirably accurate picture of a squid! Though I'm not totally sure what the phrase "survival intelligence" means, the last sentence is the only glaring error. It is, therefore, concluded that besides sucking discs, arms, and nerve fibres, octopi can also regenerated corneal tissue. Neat! But probably not an ability they exercise very often in the wild. It seems much more likely to me that a predator would snap off an arm tip than nibble at a cornea. Pink Tentacle points out that these "mutants" are believed to result from abnormal regeneration after an injury. An arm gets bitten off, and the regenerative ability goes wild, growing back not just one, but two, or a dozen, new arms. This sort of turbocharged regeneration, albeit more restrained, is also seen in sea stars. 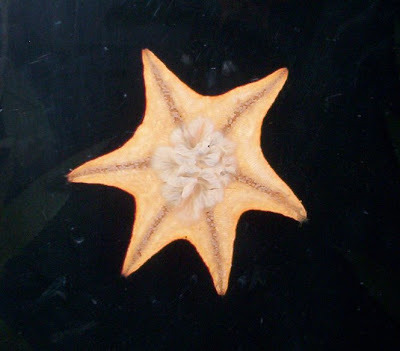 When poking around tidepools, I often find six-armed instances of the normally five-armed bat star. However! 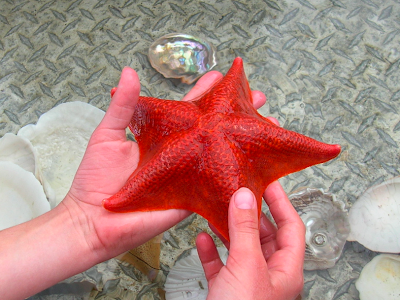 Even sea stars, the masters of regeneration, have a hard time growning a whole new body from just one arm. In fact, there is only one genus, Linckia, that can do it. In all other species, the severed arm simply dies, while the rest of the body works to replace it. And that's all cephalopods can do, too. There is no evidence, no matter how special the circumstances, that a squid or octopus can ever re-grow a severed head or body. Arm, yes. Cornea, yes. Entire head? No. But wouldn't it be cool if they could?